Despite shooting a 67 Sunday at Chambers Bay, Billy Horschel ripped the USGA for not taking better care of the greens and not providing a better experience for fans following players. UNIVERSITY PLACE — In a scathing indictment, PGA Tour player Billy Horschel blasted the greens and the fan experience at Chambers Bay Sunday after shooting a final-round 67 to finish the tournament at four-over 284. Horschel, the 20th-ranked golfer in the world and 2014 FedEx Cup champion, didn’t hold back, and claimed he was speaking for many of his fellow pros. “I think a lot of players, and I’m one of them, have lost some respect for the USGA and this championship this year for the greens,” he said. “And not only the greens. One of the biggest issues I have is for the fans. Here we are in the Pacific Northwest, where we haven’t been since the late ’90s (for the PGA Championship), and the viewing is awful. Playing the ninth hole, Horschel missed a putt from inside 10 feet and then made a waving hand motion to imitate how the ball “fishtailed,” in his words. The lack of consistency on the greens were one of his many issues with the setup. He said his frustration was building for the past few days. Horschel took special aim at USGA executive director Mike Davis, who helped bring the tournament to University Place and has played an instrumental role in setting course conditions. “I’ve known Mike for roughly 10 years now since I was on the Walker Cup team,” Horschel said. “I don’t know what he is. Obviously, he is inside the ropes the last couple of days, but he’s not on the putting green seeing the way the balls move. He’s from a little bit of a distance. Horschel said that some players aren’t speaking for fear of criticism, but implied most feel similarly: Chambers Bay is great from tee to green, but the putting surfaces, a mix of poa annua and fescue, are problems because of their lack of consistency. He wants the USGA to admit they made a mistake, own up to it and make sure it doesn’t happen again. Horschel said when he was here six weeks earlier, the course was green. “The greens rolled a lot better than they did now; they had grass on them,” he said. “They weren’t very fast. They weren’t bouncing like they are this week. And I think when they went ahead and cut them down, they tried to get them quicker and faster. That’s when they lost some of the fescue and that’s when all the dirt started showing up, and the only thing that survived was the poa. 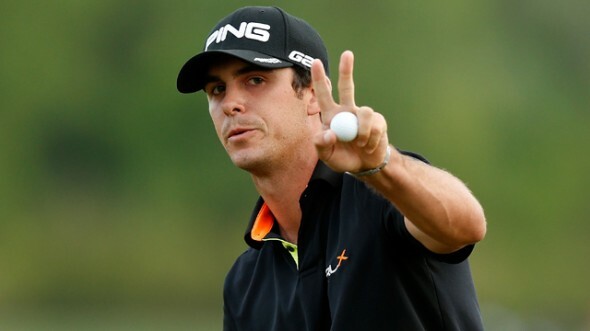 Horschel tried to make sure his audience understood what he was criticizing. “I had a great experience this week — the fans were awesome,” he said. “I just wish they were closer to us so they would have seen the golf course the way we were and see the shots we were hitting. They would have a closer feeling to us. There’s no fans on No. 8, none. I’ve never seen a golf course at any championship ever where there’s no fans on a hole at all. Can the complainers prove Chambers Bay favors one golfer over another or they just whiners? Pristine conditions or not play on or get off the course. Double blunder. Inconsistent greens and poor fan viewing. They’ll fix it. But how strange. They get the one June in 10 years when the weather is heaven. The sun is free. The grass gets fried. As the British say, “bad luck, eh?”. As one who was there for all four rounds, spectator access simply must be addressed. He has legitimate criticisms and they must be addressed if Chambers Bay is ever going to get another PGA tournament. With all this complaining, screw the PGA players. I’ll gladly take the LPGA’s return, and I’d love it if the men’s tour never returns here.